The research of fuel cells as alternative power generators is growing significantly. The humidity of the feed stream is vital to the performance of proton exchange membrane fuel cells. Also, the surface energies of fuel cell components is related to electro-osmotic drag, back diffusion of water, and water retention. In this paper, the surface energies of different fuel cell components have been measured via Inverse Gas Chromatography (IGC SEA) over a range of relative humidities. Additionally, the water sorption isotherms have been determined using Dynamic Vapour Sorption (DVS). Proton exchange membrane fuel cells (PEMFC) are an expanding area of research for use as low pollution power generators. The relative humidity (RH) of the feed stream is a critical parameter affecting PEMFC performance. If the hydration level is too low, the polymers exhibit greatly reduced ionic conductivity  and proton transport will be insufficient. Alternatively, if the hydration level is too high, excess water can flood the pores in the Gas Diffusion Layers (GDLs) and catalyst layers, eventually leading to blockage of reaction sites or reactant transport impediments within the electrode structure [2,3 ]. Therefore, characterizing thermodynamic properties of wetting, such as internal surface energy, over a range of RHs is vital to the successful development of PEMFC components. Surface energy determines the wetting affinity of liquid water for both the membrane, as related to electro-osmotic drag and back diffusion of water, and GDL, as related to water removal and retention from a fuel cell. These wetting phenomena occur on a nanometre scale for the membrane and are controlled by the type and extent of anionic chemistry (i.e. sulfonate or phosphonate groups) of the polymer side chains. As for GDL wetting, it occurs mainly on a micrometer (substrate) to sub-micrometer (bilayer coating) scale and may vary widely depending on whether water is wetting externally (from catalyst layer to GDL or visa versa) or internally (along a network of pores formed by the carbon fibres). In addition, GDLs are treated with a hydrophobic fluoropolymer (PTFE or FEP) to create a dual wetting characteristic of hydrophobic and hydrophilic regions for the internal pore surface. The proper balance of hydrophobic and hydrophilic regions, for both the GDL and membrane, must be maintained throughout the life of the PEMFC, or mass-transport performance losses (for the GDL) and ionic conductivity losses (for the membrane) will be experienced at long operating times (~1000 hr and longer). This study investigates the surface thermodynamic properties of proton exchange membranes and GDLs using Inverse Gas Chromatography (IGC SEA) and water sorption properties using Dynamic Vapour Sorption (DVS). IGC SEA is a well-known tool for the characterization of particulates , fibres , and films . IGC SEA involves the sorption of a known vapour (probe molecule) onto an adsorbent stationary phase (solid sample) with unknown physico-chemical properties. This approach inverts the conventional relationship between mobile and stationary phase found in analytical chromatography. The stronger the interaction, the more energetic the surface and the longer the retention time. For this reason a range of thermodynamic parameters can be derived from the retention behaviour. A detailed explanation of the theory is given in Reference . One of the most commonly used parameters for the description of the energetic situation of a solid surface is the surface energy, which is analogous to the surface tension of a liquid in contact with air. This is typically divided into two components: dispersive (i.e. London, van der Waals forces) and specific (i.e. acid-base, hydrogen bonding). IGC SEA is advantageous in that it allows for determination of total, dispersive, and specific contributions to the surface energy of a solid within a single experiment. The dispersive surface energy can be directly calculated from the retention times of a series of injected n alkanes . The specific contribution of the surface energy is obtained indirectly via the specific free energy (G), which can be obtained by injecting a range of polar probe molecules. By applying the van Oss concept , the acid and base numbers in the same unit as the surface energy can be obtained. In order to understand the fundamental relationship between water wetting of the GDL/membrane, surface energy, and optimum water transport in an operating PEMFC over long testing periods, a complete picture of the surface energy contributions (and changes over time) must be obtained. were measured at 30°C and 10, 50, and 90% RH. For the IGC SEA experiment the samples were cut into thin strips and inserted into silanised glass columns (30 cm long, 4 mm ID). Prior to measurement the sample was pre-treated at 303 K for 2 hours in situ. IGC SEA measurements were carried out using the SMS-IGC SEA 2000 system (Surface Measurement Systems, UK). The samples were measured at 303 K with a helium carrier gas flow rate of 10 ml/min. Probe molecules were undecane, decane, nonane, octane, heptane, hexane, dichloromethane, acetone, ethyl acetate, ethanol and acetonitrile. For the membrane samples and the plain GDL sample, undecane, decane, nonane, and octane were used for the alkanes. For the two treated GDL samples nonane, octane, heptane, and hexane were used for the alkanes due to the stronger vapour interactions with these samples. All solvents were supplied by Aldrich and were HPLC grade. The probe molecules were injected from the head-space via a loop with 250 μl volume. The injection concentration was 0.03 p/p0. The deadtime was determined by a methane injection. The experiments were run at least three times for each sample. DVS is a well-established method for the determination of vapour sorption isotherms. The DVS instrument used for these studies measures the uptake and loss of vapour gravimetrically using the SMS Ultrabalance with a mass resolution of at least ±0.1 μg. The high mass resolution and excellent baseline stability allow the instrument to measure the adsorption and desorption of very small amounts of probe molecule. The vapour partial pressure around the sample is controlled by mixing saturated and dry carrier gas streams using electronic mass flow controllers. The temperature is maintained constant ±0.1 °C, by enclosing the entire system in a temperature-controlled incubator. For the DVS experiments, a small (~ 1 cm2) section of film was placed in a stainless steel mesh sample pan. The 400 mesh pan (400 lines per inch) allowed direct vapour flow to all sides of the film. The sample pan was then placed in the DVS at 25 °C and dried at 0% RH to establish a dry mass. After a stable, dry mass was achieved, the sample was exposed to the following humidity profile: 0% to 95% to 0% RH in 5% RH steps. Mass equilibrium was reached at each humidity stage by measuring the percentage change in mass with respect to time (i.e. slope or dm/dt). Once the mass slope was below a predetermined threshold value and equilibrium was achieved, the experiment proceeded to the next programmed humidity stage. Figure 1 displays the dispersive surface energy results for the two proton exchange membranes at 10, 50, and 90% RH. As the humidity was increased, the dispersive surface energy of the two proton exchange membranes decreased (29.5 mJ/m2 at 10% RH to 23.0 mJ/m2 at 90% RH for the BPSH-30 sample; 29.1 mJ/m2 at 10% RH to 27.7 mJ/m2 at 90% RH for the Nafion 1135 sample), suggesting that preferential wetting of the hydrophilic side chains occurred. When exposed to a sulfonated membrane, water vapour will preferentially condense at/near hydrophilic sulfonate groups on the polymer side chains leaving the ‘hydrophobic’, PTFE-like backbone of the polymer more exposed to vapour. As the RH is increased, a higher fraction of the vapour-exposed internal pore volume of the polymer membrane would be that of the PTFE-like backbone. This situation would leave a more overall hydrophobic solid-vapour interface within the membrane and might explain a reduced component to dispersive wetting. In contrast, the specific surface energies of the membranes (see Figure 2) increased with increasing humidity (5.3 mJ/m2 at 10% RH to 15.3 mJ/m2 at 90% RH for the BPSH-30 sample; 14.3 mJ/m2 at 10% RH to 22.4 mJ/m2 at 90% RH for the Nafion sample). The increase in specific surface energies may be due to interaction of the polar probes with water on the PEM surfaces. DVS studies show the membranes sorb significantly more water as the humidity increases, (see Figure 3). For instance, by 90% RH, both samples sorb over 13% of their dry weights in water vapour. The relatively high mass increases indicate water uptake is dominated by bulk water absorption. Coupled with the changes in surface energy with humidity, the high water uptakes indicate the membranes’ properties are greatly affected by the amount of water vapour present. Figure 1. Dispersive surface energy values for the membranes at 30°C and three RHs (10%, 50%, and 90%). Comparing the two membrane samples, BPSH-30 sorbs measurably more water than the Nafion 1135 sample between 10 and 95% RH. Also, Figures 1 and 2 show that increasing the RH to 90% affected the surface energetics of BPSH-30 to a greater extent than Nafion 1135. This finding could be due to the greater RH dependence of water vapour absorption of BPSH-30, as clearly shown in the gravimetric results. A previous study indicated that the water absorption of BPSH-30 abruptly increased at ~ 80% RH where hydrophilic domains of BPSH-30 became continuous . Although, the current study shows a steady increase in mass across the entire humidity range, there is a sharp change in surface energies between 50 and 90% RH. Again, the higher water uptakes of the BPSH-30 sample are reflected in the greater RH dependence of the surface energy results. Figure 3. 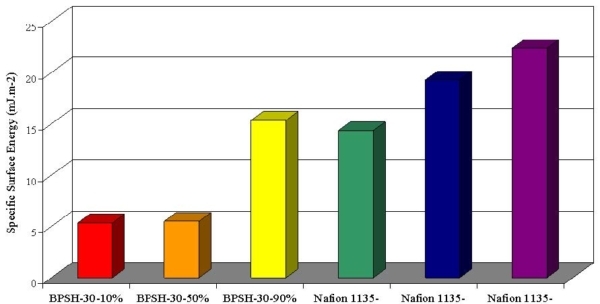 Water sorption isotherms for the BPSH-30 (red) and Nafion 1135 (blue) samples between 0 and 95% RH and 25 °C. Figure 4. Dispersive surface energy values for the GDLs at 30°C and three RHs (10%, 50%, and 90%). Similar surface energy experiments were performed for three GDLs at the same conditions. The GDLs contained the same fibre type (Toray TGP-H 060 substrate) with different hydrophobic treatments: “plain” (no PTFE, no bilayer), “BA” (5 wt% PTFE substrate, no bilayer), and “bilayer” (5/23 wt% PTFE substrate/bilayer). The dispersive surface energies are displayed in Figure 4 and specific surface energies in Figure 5. For all three GDL samples the dispersive surface energy decreases with increasing humidity. For the specific surface energies, the trends are more complex. While the BA GDL shows an increase in specific surface energy with increasing humidity, the Plain and Bilayer samples generally decrease with increasing humidity. The decrease in specific surface energies may be due to competitive adsorption between water on the surface and the IGC SEA probe molecules. Water molecules may be preferentially adsorbing to higher energy sites, leaving lower energy areas exposed to the probe molecules. The water sorption isotherms in Figure 6 indicate the surfaces are much more hydrophobic than the membranes. 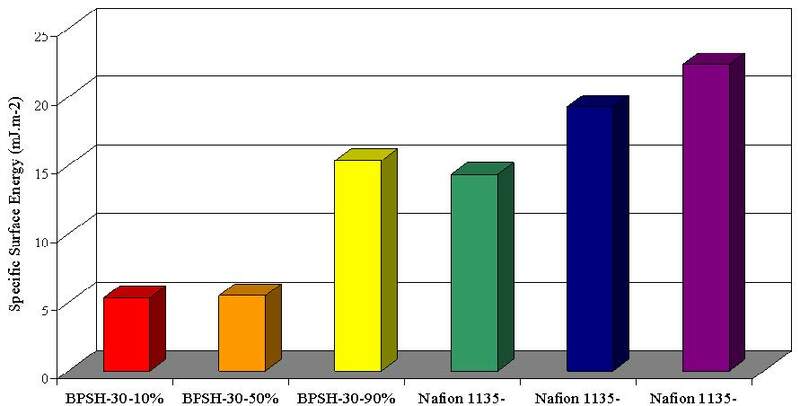 The two membranes (BPSH-30 and Nafion 1135) uptake over 14% of their weight in water, while the GDL samples sorb less than 0.12% of their dry weights in water. Comparing the results between GDL samples, the dispersive surface energies obeyed the following trend: BA > bilayer > plain. 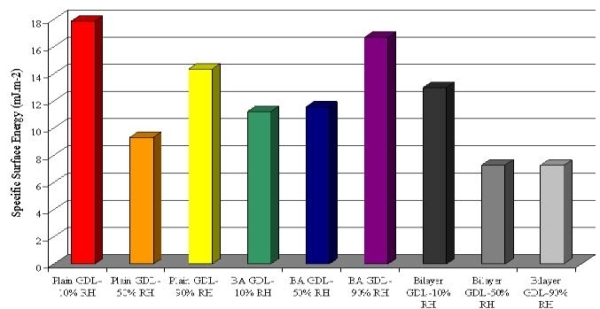 The treatments used in the BA and bilayer GDL samples clearly increase the dispersive contributions to the surface energy. Interestingly, the bilayer sample fell between the BA and plain samples. This finding is explained by the fact that the bilayer, although it has a high loading of hydrophobic PTFE, has a high amount of particulate carbon (i.e. 77 wt% with relatively high surface area and mild hydrophilicity). Therefore, application of the state-of-the-art bilayer formulation simultaneously increases both the hydrophobicity and hydrophilicity of the resultant GDL material over the “BA” state. As stated previously, the dispersive surface energy of the GDLs decreased as the humidity increased. 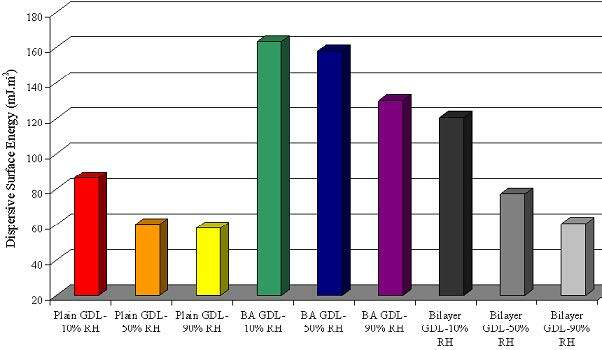 The degree of reduction in dispersive surface energy in going from 10% RH to 90% RH was greatest for the plain and bilayer GDLs, as illustrated by a decrease of almost 33% for the plain sample and only a 20% decrease for the BA sample. The specific surface energies in Figure 5 reveal the following trend at 10% RH: plain > bilayer > BA. This is the opposite relationship from the dispersive surface energy. As with the dispersive surface energy, the specific surface energies for the Bilayer and Plain GDLs show the greatest RH dependence. The Bilayer sample sorbs significantly more water than the other two samples. As stated earlier, the Bilayer sample has a high amount of particulate carbon with a high surface area, which would increase water uptake. The BA GDL sample shows the lowest water uptake, confirming the surface is more hydrophobic. The increased water sorption of the Plain and the Bilayer samples may be causing the greater RH dependences in the surface energy values. Figure 5. Specific surface energy values for the GDLs at 30°C and three RHs (10%, 50%, and 90%). Figure 6. 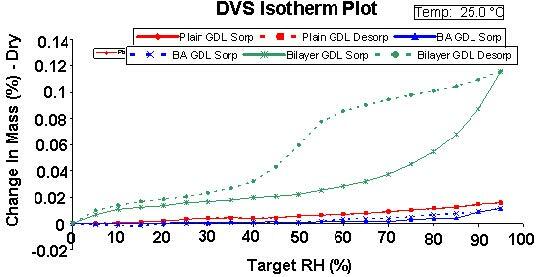 Water sorption isotherms for the Plain GDL (red), BA GDL (blue), and Bilayer GDL (green) samples between 0 and 95% RH and 25 °C. Surface energies and water uptakes were measured for several membranes and GDLs over a range of RHs. For the proton exchange membranes, the dispersive surface energy decreased, while the specific free energies increased, with increasing humidification. 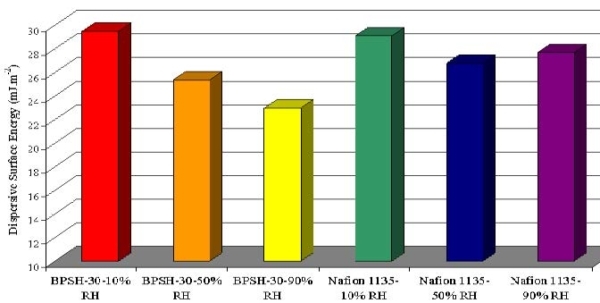 The water sorption results indicate the BPSH-30 sample is more hydrophilic than the Nafion 1135 sample, causing a greater RH dependence in the surface energy results for the BPSH-30 sample. For the GDL samples, the dispersive surface energy decreased as the humidity increased. The humidity effects on the GDL specific surface energies were more complex: the Plain and Bilayer samples specific surface energies decreased, while the BA specific surface energy increased from 10 to 90% RH. Similar experiments could be applied to other fuel cell components over a wide range of temperature and humidity conditions. Hydrogen, Fuel Cells & Infrastructure Technology (program manager: Nancy Garland). The author would also like to thank SGL Technologies GmbH (Meitingen, Germany) for providing the hydrophobic treatments of the GDLs. SMS also thanks Frank Thielmann, David Wood and Yu Seung Kim for their contributions to the Case study. T.V. Nguyen and N. Vanderborgh, J. Membrane Sci. Vol. 143, p. 235 (1998). W-k Lee, S. Shimpalee, and J.W. Van Zee, J. Electrochem. Soc. Vol. 150, p. A341 (2003). T.A. Zawodzinski, M. Neman, L.O. Sillerud, and S. Gottesfeld, J. Phys. Chem. Vol. 95, p. 6040 (1991). F. Thielmann, J. Chromatography A Vol. 1037, p. 115 (2004). A. van Astem, et al, J. Chromatography A Vol. 888, p. 175 (2000). C. Pawlisch, A. Macris, and R. Laurence, Macromolecules Vol. 20, p. 1564 (1987). J. Schultz, et al., J. Adhesion Vol. 23, p. 45 (1987). C. Oss, R. Good, and M. Chaudhury, Langmuir Vol. 4, p. 884 (1988). C. Della Volpe and S. Sibioni, J. Coll. Interf. Sci. Vol. 195, p. 121 (1997). F. Thielmann and D. Burnett, in preparation. F. Wang, M. Hickner, Y.S. Kim, T.A. Zawodzinski, and J.E. McGrath, J. Membrane Sci. Vol. 197, p. 231 (2002). W.L. Harrison, M.A. Hickner, Y.S. Kim, J.E. McGrath, Fuel Cells Vol. 5, p. 201 (2005).